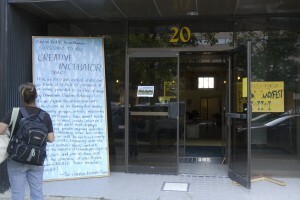 The Creative Incubator team dressed up the space in hurry-up fashion, erecting tables out of sawhorses and old doors, borrowing potted flowers from backyards, throwing beer, wine and sodas into a cooler, and serving sandwiches and vegetable trays from the Dugout Deli for refreshments and snacks. 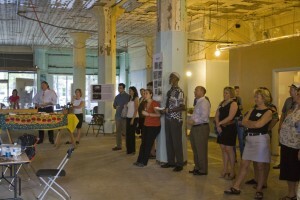 About thirty catalysts, task force members and guests were on hand to see the space in its raw state and to enjoy a bit of conversation with other catalysts. Guests were also presented with a brief YouTube video that documented a very successful and established community third place called AS220 operating in Providence, Rhode Island. This video, although highly representative of what could happen at 20 N. Jefferson, was intended more to show the process by which a community space can evolve over time, and what impact a project like this can have on the cultural revitalization of a city. Feedback from the event was very positive, and people were excited about seeing the space and beginning to visualize the kind of community activities that could occur there. However, an important question came up more than once: How does a project like opening an arts based community third place improve the economic prosperity of the Dayton Region? How does a space like 20 N. Jefferson happen without an infusion of big funding? It happens slowly and sequentially. You start by generating energy in a raw space the way we are starting to draw energy to 20 N. Jefferson. You hold some events, you get some enthusiasm and buy-in. You get some enthusiasm and buy-in, you hold some more events, and you get more energy, enthusiasm and buy-in. You get enough energy and buy-in, and you get people who want to get involved as entrepreneurs. And entrepreneurship breeds economic prosperity faster and better than any foundation or endowment ever could. The entire Creative Incubator committee believes strongly in the successful outcome (with metrics and all) of this initiative because it speaks directly to so many of the things that young creatives are seeking in life. 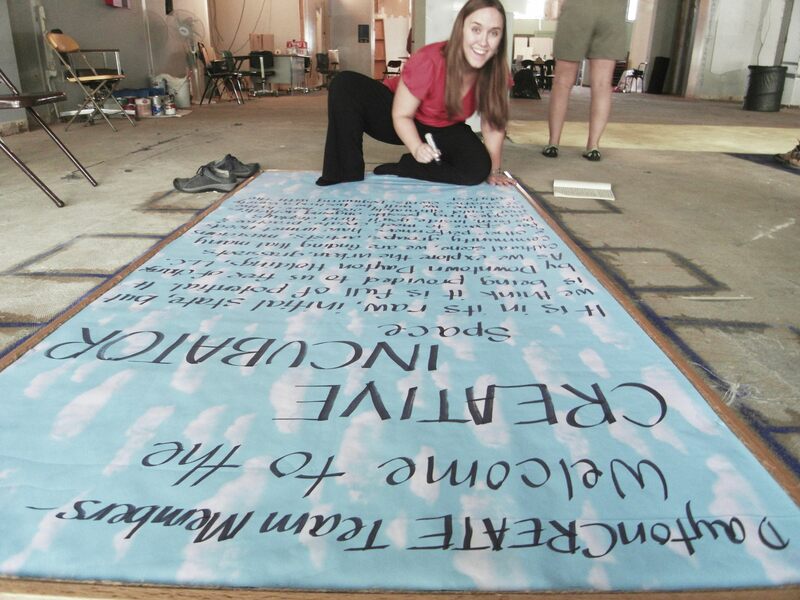 If downtown Dayton could become a playground for the creative class, the creative class– with all its idealistic youth, energy, vitality, intelligence and humor– would come out to play. And where the creative class is drawn to play, they’re also drawn to work, and they tend to make and spend a fair amount of money. This entry was posted on Friday, August 8th, 2008 at 6:39 pm	and is filed under Creative Incubator. You can follow any responses to this entry through the RSS 2.0 feed.